The Trost-Schau took place in Stuttgart from the 25th to the 26th April 2015. As in every year, thousands of visitors thronged the exhibition to see what‘s new and do some serious shopping. The tool specialist KS Tools from Heusenstamm in Hessen was there too. 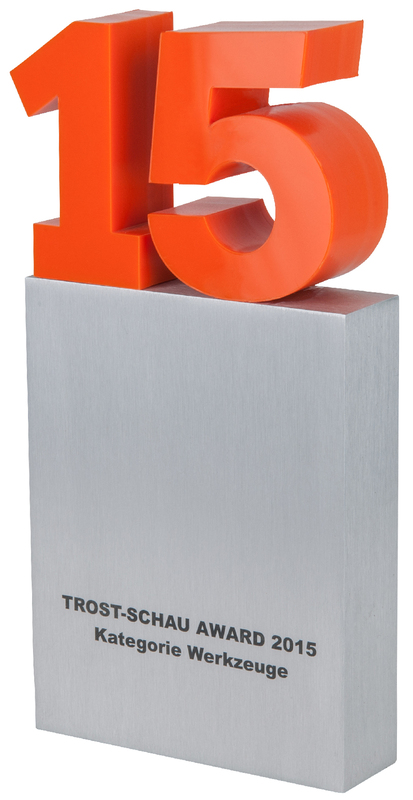 With its team of 45 staff and a stand area of 336 square metres, KS Tools received the coveted Trost-Schau award. The visitors voted the company „best exhibitor“ in the tool category. KS Tools had strung together an attractive agenda for the trade fair. Throughout the entire exhibition, a staff of 45 and four hostesses attended the visitors. At 336 square metres, the stand this time was of a size as never before at a Trost-Schau. The open and inviting stand concept obviously impressed the visitors. As KS Tools had already won last year‘s award for the best trade fair representation, the goal this time for the ambitious KS team was the award for the „Tool“ category. So this award is no coincidence – rather a well-earned reward for flawless preparation and a successful stand concept. And the exhibition offerings from KS Tools were certainly nothing to be sneezed at – a special highlight was the fully equipped Masterline workshop roller cabinet and a Basic roller cabinet besides as an encore. The Slim Power air screwdriver including socket set and the 179-piece socket wrench set plus pocket light were also fast sellers at the exhibition. Two demonstration „islands“, in each of which five colleagues presented tools at colourful models, were heavily besieged at each demonstration. A bright red Ferrari 458 GT3 in the middle of the stand as well as models of a utility vehicle and a Ferrari engine likewise aroused the visitors‘ interest. KS Tools used the Trost-Schau to simultaneously introduce all the visitors to the new special tool catalogue On their departure, each customer received a small flyer with which they could then order the catalogue from the comfort of their own home. To this end, customers only have to register on the internet portal www.mykstools.de using the registration code on the back of the flyer to then automatically and free of charge have their personal K15 Motor Vehicle Special Tool Catalogue together with the associated catalogue for hand tools posted to them. The stand was in full swing on both days of the trade fair. Just as everywhere else in the well filled exhibition hall, the visitors thronged the KS Tools stand. The tool professionals thought up all manner of things to delight, for example, even the smallest visitor.